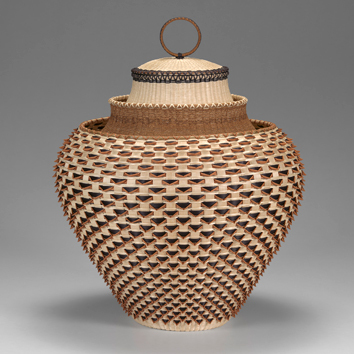 The Taubman Museum of Art is pleased to present Hear My Voice: Native American Art of the Past and Present, a statewide Virginia Museum of Fine Arts exhibition that explores conversations between Native American artists and their art across centuries, a continent, and 35 indigenous cultures. The exhibition features 56 works spanning from 400 A.D. to the present day that illustrate the ways in which Native American art speaks of a shared knowledge and shared history while also being incredibly diverse in subject matter, style, medium, and age. 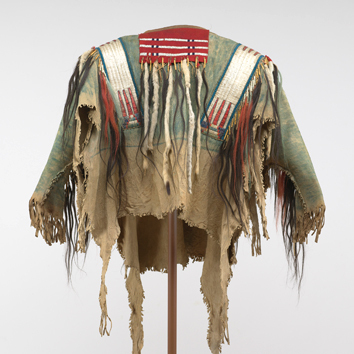 From a wooden Raven rattle created by a Tsimshian artist and a war shirt crafted by a member of the Crow Nation in the late 19th century to contemporary works by Cherokee painter Kay WalkingStick and Passamaquoddy basketmaker Jeremy Frey, objects in this exhibition point to the deep and intimate understanding Native Americans have of their land. Audio recordings of some present-day artists discussing works from the past provide greater insight into how Native Americans use art to maintain a connection with their history. Works in the exhibition are drawn from the Virginia Museum of Fine Arts’ own collection, as well as loans from other institutions and individuals—including works that have been acquired or loaned to VMFA from the renowned Robert and Nancy Nooter Collection. Other exhibition lenders include Susan and David Goode, the Skiles Family Collection, Altria Group, the Fralin Museum of Art at the University of Virginia in Charlottesville, and the Muscarelle Museum of Art at the College of William and Mary in Williamsburg. Works loaned by three Virginia artists represent the Upper Mattaponi and Pamunkey tribes of Virginia. Exhibition and educational support of the exhibition is provided in part by Member One Federal Credit Union and Sally and Walter Rugaber. Dr. Minich will give a talk on this exhibition on Friday, October 5. Click here for details. Hear My Voice: Native American Art of the Past and Present is on view in the Taubman Museum of Art’s Medical Facilities of America Gallery and the Temporary Exhibition Gallery from October 5, 2018, through January 6, 2019. 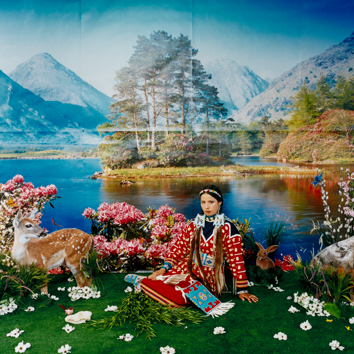 Wendy Red Star (Crow, born 1981), Four Seasons (Spring), 2006, printed 2016, Archival pigment print on Sunset fiber rag mounted on Maxx Metal. Virginia Museum of Fine Arts; Aldine S. Hartman Endowment Fund. 2016.213-.216. 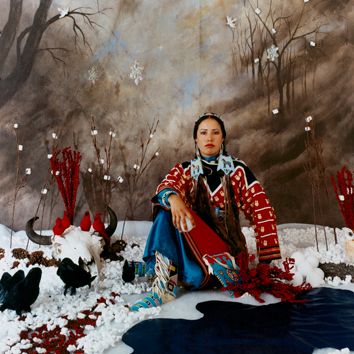 Wendy Red Star (Crow, born 1981), Four Seasons (Winter), 2006, printed 2016, Archival pigment print on Sunset fiber rag mounted on Maxx Metal. 2016.213-.216. Virginia Museum of Fine Arts; Aldine S. Hartman Endowment Fund. 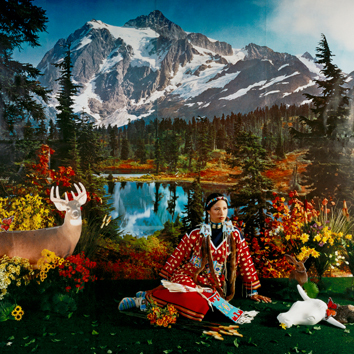 Wendy Red Star (Crow, born 1981), Four Seasons (Fall), 2006, printed 2016, Archival pigment print on Sunset fiber rag mounted on Maxx Metal. 2016.213-.216. Virginia Museum of Fine Arts; Aldine S. Hartman Endowment Fund. Wendy Red Star (Crow, born 1981), Four Seasons (Summer), 2006, printed 2016, Archival pigment print on Sunset fiber rag mounted on Maxx Metal. Virginia Museum of Fine Arts; Aldine S. Hartman Endowment Fund. 2016.213-.216.